The interaction of the multiple environmental factors just discussed is responsible for the diverse temporal and spatial patterns observed in algal composition and biomass. Temporal patterns fall into three categories (Biggs 1996): (1) relatively low but constant biomass when disturbance is frequent; (2) cycles of accumulation and loss when disturbances are less frequent; and (3) seasonal cycles owing to seasonal change in the environmental factors discussed above. 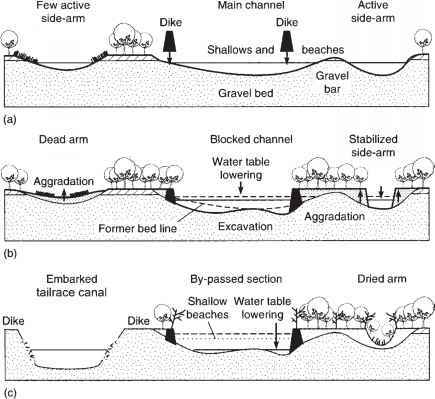 Spatial variation is likewise associated with locational differences in controlling variables, for example, between riffles and pools and among streams differing in size and landscape position. Seasonal abundance data from the tropics are few, but numerous studies of stony streams from Europe, Japan, and North America suggest a fairly regular seasonal pattern in temperate streams. Diatoms dominate during winter and continue to be a major component of the flora in spring and early summer, although the species composition changes. Other groups can become abundant during summer, particularly green algae and cyanobacteria. In temperate rivers, total abundance and biomass generally is greatest in the spring, and a secondary peak can occur in autumn. In streams of Tennessee, daily chlorophyll-specific primary production peaked in the spring, and then chlorophyll concentrations decreased after leaf emergence, reached a minimum in summer due to shading and then increased again in the autumn. In these rivers, seasonal changes were primarily related to changes in light availability (Hill and Dimick 2002). In streams of Hubbard Brook Experimental Forest, New Hampshire, both light and N concentrations are higher in the spring before leaf-out, which likely explains higher biomass accrual rates in spring compared to summer and autumn (Bernhardt and Likens 2004). A factorial manipulation of grazers, nutrients, and irradiance demonstrated how factors limiting periphyton can change seasonally (Rosemond et al. 2000). Periphyton biomass was limited by light in fall and summer but not in spring, while nutrients limited periphyton when light availability was higher. In tropical rivers, seasonality in hydrology can be important. In the Daly River, northern Australia, annual variation in benthic algae biomass is primarily controlled by seasonal changes in flows (Townsend and Padovan 2005). During the dry season, low velocities favored the colonization and growth of Spirogyra, which appeared in the river in mid-May, increased in biomass through July and August, and disappeared from the river at the beginning of the wet season in late October or early November (Figure 6.13). The frequent high flow disturbances that occurred during the wet season probably limited the colonization and growth of Spirogyra, primarily due to abrasion and dis-lodgment.